If you're familiar with Thai and Indonesian cooking you'll immediately recognize the flavors in this barbeque chicken recipe as Satay. 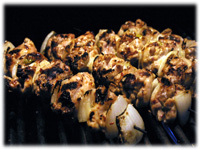 Traditionally there would be several cubes of meat, usually chicken or lamb, on a skewer with a rich, thick peanut dipping or drizzling sauce. 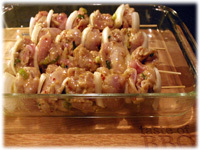 For this recipe we've included slices of onion on the skewers to separate the chicken and give more flavor to the recipe. This recipe relies on the Thai chicken marinade (also repeated below) to give the meat a robust long-lasting flavor. 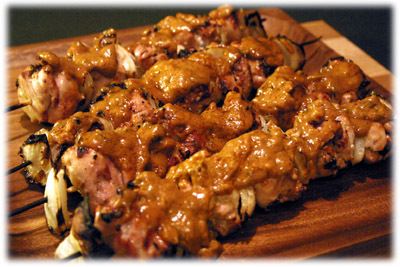 When the chicken comes off the grill you'll finish off the presentation with this Thai peanut sauce recipe (also repeated below) - you can provide it to dip the kebabs in or just drizzle over them before serving. Tip: I find the darker meat boneless skinless thighs work best for this type of chicken recipe - the meat stays much juicier all through grilling. 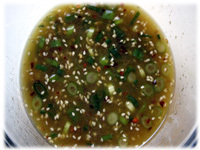 In a small glass bowl combine all marinade ingredients and blend well. Cut the chicken into cubes about 1" X 1", or basically bite-sized. 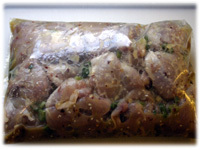 Pierce the meat all over with a fork to help the marinade penetrate, place the cubes in a resealable freezer bag and pour in the contents of the marinade recipe. Refrigerate for 2 - 4 hours or up to overnight. The longer the marination the stronger the flavors. To make the Thai peanut dipping sauce pour the chicken broth in a small saucepan and bring to a boil. 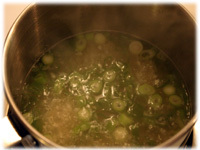 Reduce heat to a simmer and add the chopped green onion and garlic. Simmer several minutes until the onion softens. 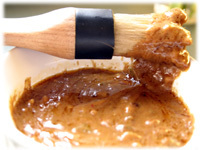 Combine the remaining ingredients for the peanut dipping sauce and stir very well to combine. Continue stirring until the oils are well blended and don't appear separated. Remove the chicken from the marinade. 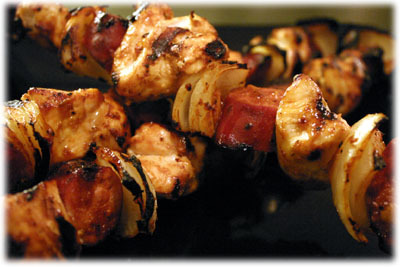 Place a piece of onion on a skewer followed by a cube of marinated chicken. Alternate onion/chicken until you've threaded as much chicken on the skewer that you want. Preheat the grill to 450F - 475F. Place the chicken skewers on the heated grill and close the lid. 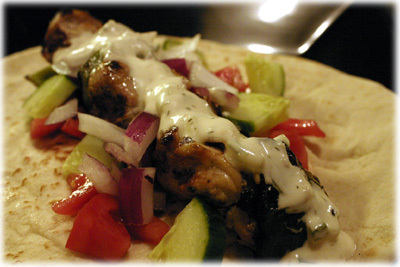 Every 5 minutes flip the chicken skewers 1/4 turn to ensure all sides are evenly grilled. These should be cooked in about 15 or 20 minutes but always check the internal temperature is 165F. 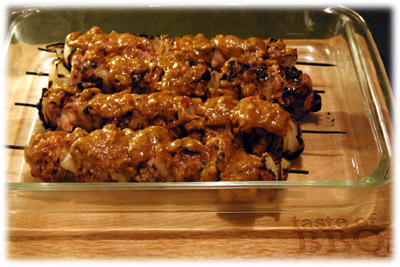 Remove the skewers from the grill and either pour the peanut sauce over the chicken or provide the sauce on the side for dipping.